The Renaissance gave the world many outstanding artists. Especially famous Italian master - Sandro Botticelli, Michelangelo Buonarroti, Titian, Leonardo da Vinci, Raphael Santi. This canvas was painted in 1480-ies. Most likely, the artist painted a picture on the order, for Villa of a wealthy nobleman Lorenzo di Pierfrancesco de ' Medici. 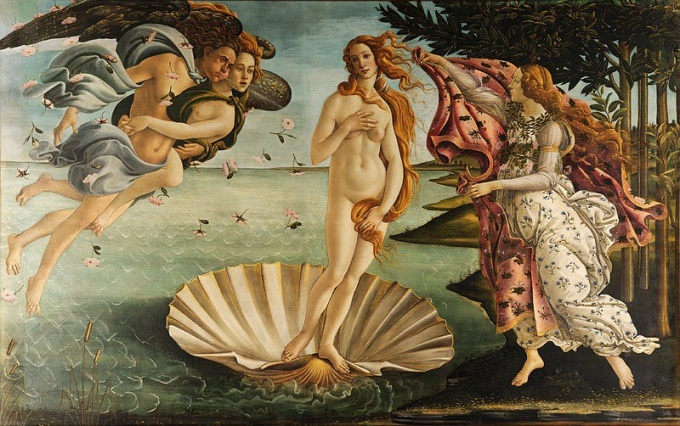 The inspiration for Botticelli was an ancient myth about the goddess of love - Venus. According to him, the goddess was born in the depths of the ocean from the sea-foam, and then the wind was taken to the island of Cyprus. There it was surrounded by nymphs and graces. The Venus pose and picture framing written in ancient traditions, Botticelli strictly followed the ancient canons. This fresco, painted by Michelangelo Buonarroti, is part of an extensive mural of the Sistine chapel ceiling in the Vatican. The painting was executed in 1511. In the mural embodied the biblical story from the old Testament, telling about the creation of man. In the center of the canvas are nearly touching hands of God and Adam. This gesture symbolizes getting man of the soul, awakening his thirst for knowledge and creativity. The fresco "Creation of Adam" is part 9 of the Central images of the ceiling of the chapel. The painting on the ceiling of the Sistine chapel became the most extensive work of Michelangelo, he did it for 4 years almost alone. The legendary painting by Leonardo da Vinci was established in the early 16th century. The canvas gave rise to many legends and theories about its creation. According to the officially accepted version, the painting depicts Lisa Gherardini, the wife of a wealthy merchant. However, some researchers believe that da Vinci portrayed here his mother, or even himself in the female form. Art historians note an unusually harmonious composition of the portrait and its natural, not typical for the art of the time. The most popular version, the picture was written in 1512-1513. The work was intended to decorate the altar of St. Sixtus in the same monastery. The painting depicts the virgin and child surrounded by Pope Sixtus II and Saint Barbara. The canvas is written in accordance with the laws of geometric composition and the figures have a sculptural impact. Two angels are depicted at the bottom of the picture, became an independent attribute of many cards, albums, advertising posters, etc. Unlike other Renaissance masters, Raphael used in his work, not the Board, and canvas. One of the most famous works of Tiziano vecelli was written in 1538. According to one version, it depicts the bride of the Duke of Urbino, on the other - his mother, the third - the lover of Titian. The image of a young naked woman, lying relaxed on the bed, the artist expressed the ideal of beauty of the Renaissance. Venus blond wavy hair, delicate features, small Breasts and rounded belly - so had to look perfect and beautiful of the 16th century.